This tutorial is outdated and no longer used.. This tutorial has only been left here for archive purposes. If you require further assistance please try our VIP ONLY forums. Alright guys, I thought that there weren’t enough decent tutorials/guides for making backups of your Xbox 360 games, so I decided to put one together myself. I figured that after burning 13 DVD+R DL coasters that I’d be a good guy and help other people form making the same mistake, so here goes. - Part 1: Creating the image. - Part 2: Inserting the SS.bin. - Part 3: Burning the image successfully. 1. 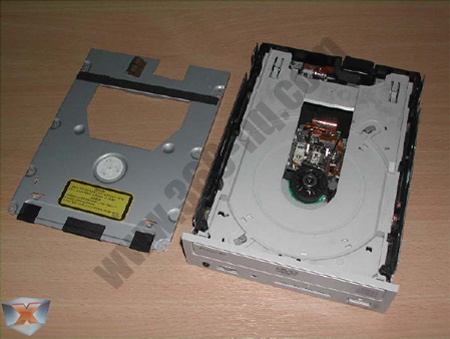 Take your DVD-drive apart: First of all we need to access the laser unit of our DVD-drive, this can usually be done by removing the screws which holds it casing! 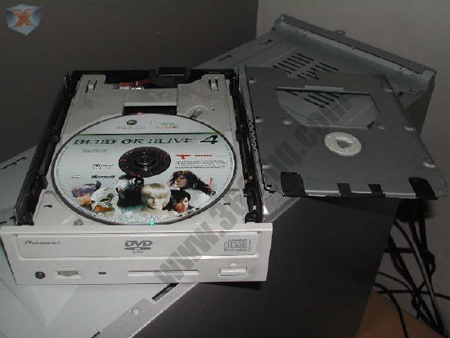 You will need to figure out yourself on how to do this for your own DVD-drive, but it should be a piece of cake. This action will most likely void your units warranty so make sure you want to do this! When you did everything correct and you see the laser unit, it will probably look something like this. 2. 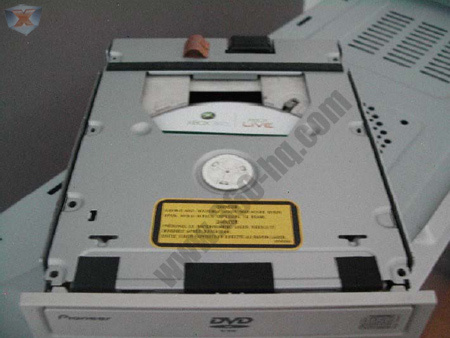 Installing your DVD-drive: The hardest part is over now and we should now connect our DVD-drive to the computer and place it on an easy accessible place. I'm sure you all know that this has to be done when the power is shutdown from your computer. 3. WxRipper: By now you should have WxRipper as we mentioned earlier and have it installed on your computer, so let's fire-up WxRipper and see how things work. 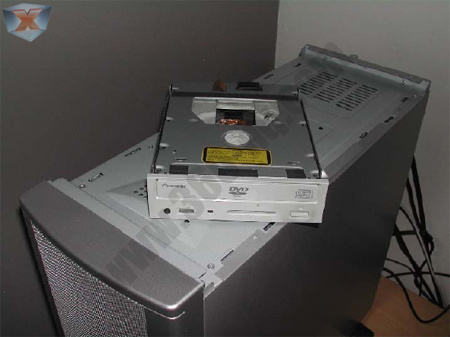 a) Put your DVD in the drive which is over 8 gigabyte (I used 24 season 2 disc3) and wait until your computer recognized it. b) From the menu select Hotswap and then "Find magic number". c) After the magic number has been found you select "Stop drive". d) Now comes the magic part, you need to switch the DVD which is in your drive with your original game. e) When everything is back in place you can select "spin drive"
f) When the drive is spinning again it's time to dump the image, this can be done by clicking on "start dump"
g) You can take a break now as this stage can take a long time depending on the read speed of your DVD drive. h) After some time, almost one hour for my case, I have now dumped my xbox360 game. 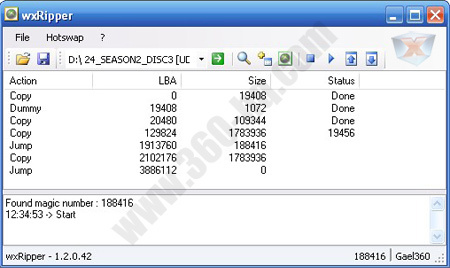 - The dumped image is an exact RAW copy of the original game disc, which means any dummy data is copied with this. 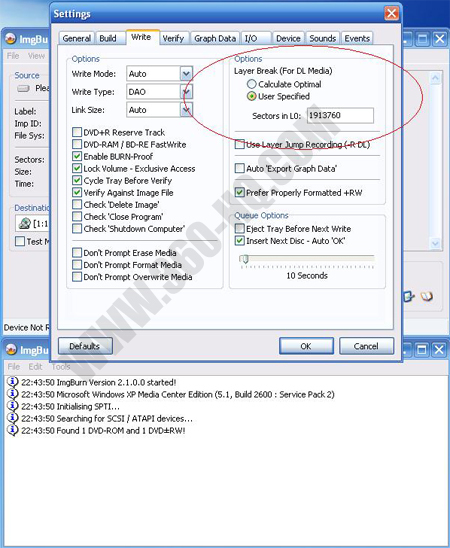 - You can now burn this .iso file to an empty DVD-R DL or you can continue with these optional steps and start experimenting with the xbox360 files. My favorite way of getting the SS.bin is also the easiest. 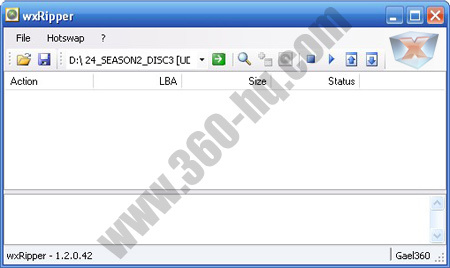 A simple download from http://www.ubclass.org/X360SS2/ and you can find the SS.bin of any game you need. b) When you have XBOX360 SS Merger running select the image of the game you extracted in WxRipper. c) It will at this point give you a message saying that the image is WxRipper Style Length. d) Then tell you about the current Security Sector. e) Now it will ask you if you want to calculate the md5 sum and verify online for the iso entry. At this point you must select YES so it will complete correctly. f) After a few minutes of what seems like nothing, in fact the first time you do this procedure you might think the program has crashed, but I assure you it’s working perfectly and you should just leave it alone until you get the following screen in about 3-4 minutes. g) Notice that the section on the right is highlighted in red and informs you of the current Security Sector, and the required SS or Security Sector. h) At this point you should go to http://www.ubclass.org/X360SS2/sslist.php and search for the SS.bin of the game you are backing up. i) Save the SS.bin in the same folder as the image you extracted from the disk. j) Select the required SS.bin in WxRipper. k) Notice when you add the SS.bin the red sections change from red to green. 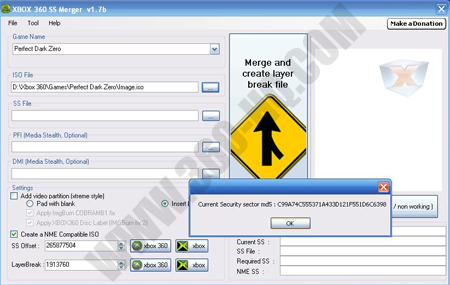 l) At this point click on Merge and create layer break file. m) A few seconds after you do this you are just about ready to burn your image to a disk. n) Open up the folder that you have your image and SS.bin and you will notice a new file that has been created by the SS Merger. 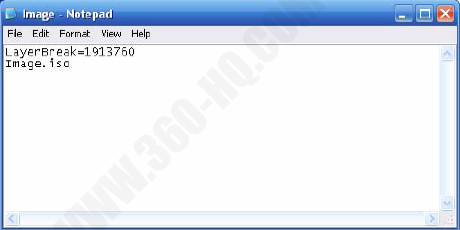 o) Open the newly created file with notepad. p) Delete the first line entirely but make note of the numbers. You’ll need those in a minute! q) Close and save the changes to the file. a) Install Imgburn on your pc and once installed open it up and go to Tools and then Settings. b) Once you open up the settings window click on the Write tab. 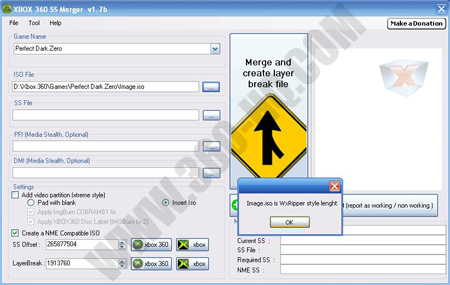 Select the “User Specified” button in the top right hand corner under the “Options” selection and in the box enter the numbers you took out of the file you created with SS Merger. c) For future reference you only have to do this once with Imgburn but you will still have to delete the first line in the file you created with SS Merger EVERYTIME! 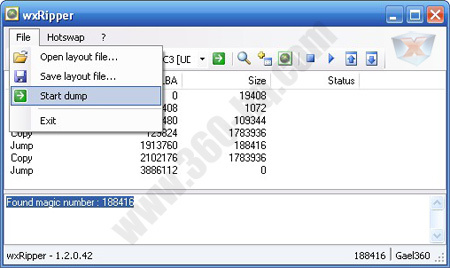 f) Select the image file in Imgburn (the one you created with SS Merger which is only about 7-10Kb in size in comparison to the actual image which is several GB in size). 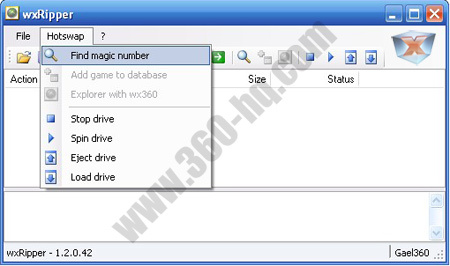 h) ESPECIALLY MAKE SURE THAT YOU WRITE THE DISK AT NO MORE THAN 2.4X!!!! 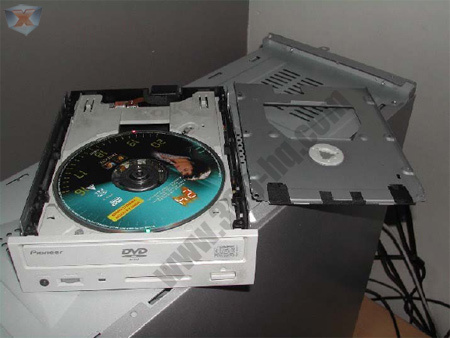 YOU DON’T WANNA RUIN ONE OF THOSE EXPENSIVE DVD+R DL DISKS BY WRITING ON TOO HIGH A SPEED FOR THE DISK. i) Once you have selected the image file for burning and inserted your DVD+R DL disk into your burner notice that the burn option becomes enabled! 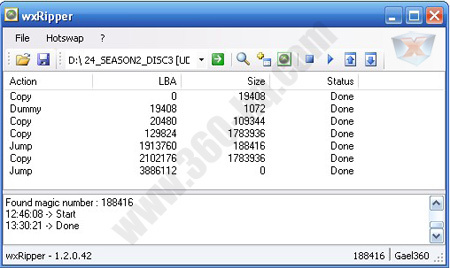 j) The screen simply gives you information on the disk you have in the drive. k) Click on Burn and sit back and wait till Imgburn is finished burning the disk which is about 40-45 minutes away. l) Last and not least, sit back and enjoy playing your freshly backed up xbox 360 disk on your newly flashed xbox 360. Any feedback on this tutorial is appreciated and welcomed. I can be reached by PM at www.360-hq.com or via the official forum topic located here.